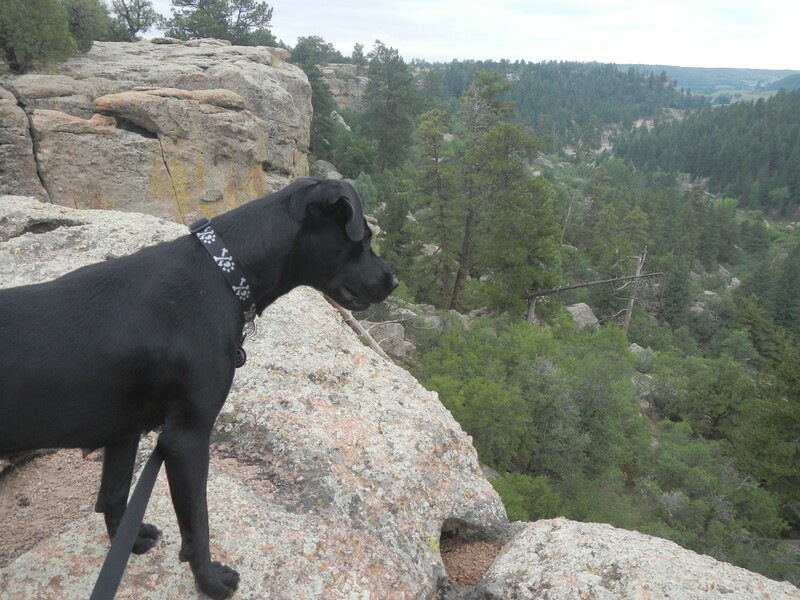 I took my new black lab puppy Anna to Colorado’s Castlewood Canyon State Park yesterday for her first time hiking. As far as I know, she’s never been on a trail before. She didn’t act like she had been, anyway, and I doubt the family who had her for a short while before me took her out. They had to return her to the shelter, because of their son’s allergies. So, I’m kind of doubting they ever took her out on the trail if their little guy has bad allergies. Plus, based on the way she acted, I don’t think she’s ever been out on long walks like a hike. As soon as we hit the trail, Anna was shaking with energy. Everything was just so exciting and such a new adventure, that I about thought she was going to burst with all of her happy energy. She was insane with eagerness. Seriously. After about a half mile of her clawing at the ground army-crawl style in an effort to get me to move faster, I had to scold her. She was choking herself silly on the leash, and it just wasn’t a good experience for either of us. At only about a year old, she has a heck of a lot more than energy than me. So, as has been the case with most everything since I got her a week ago, we had some adjustments to make while getting to know each other. I think we both did really well, though, despite the initial challenges. After the scolding, we fell into a rhythm and got on really well together. 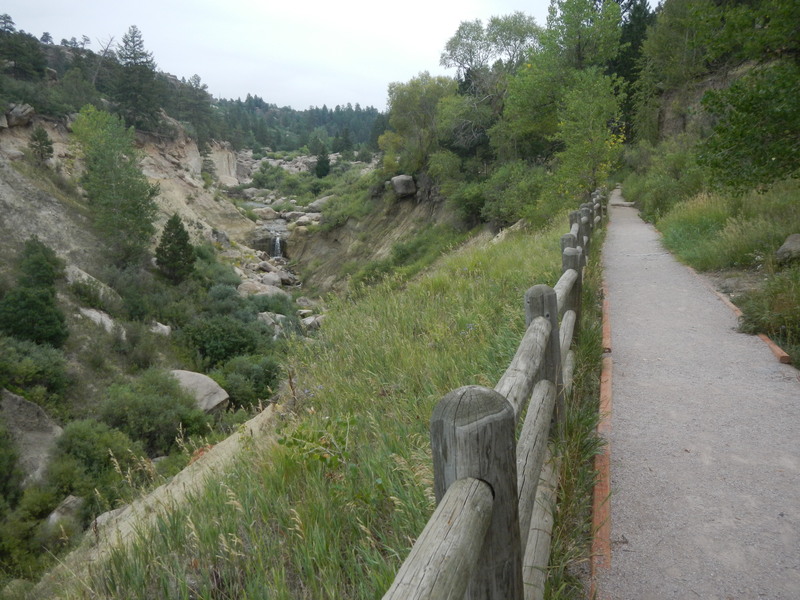 We continued down the trail at the canyon’s bottom from the park’s west entry. From there, only a short ways farther on, we reached the falls area. It’s not a huge gushing waterfall, mind you, but one that is relaxing and beautiful nonetheless. We stopped briefly to admire it – Anna still overflowing with excitement to stop any longer – and then continued on. I wasn’t really sure where we were going, since the park’s maps weren’t very good. My thought was just to go until I thought we were both getting tired and needed to turn back. 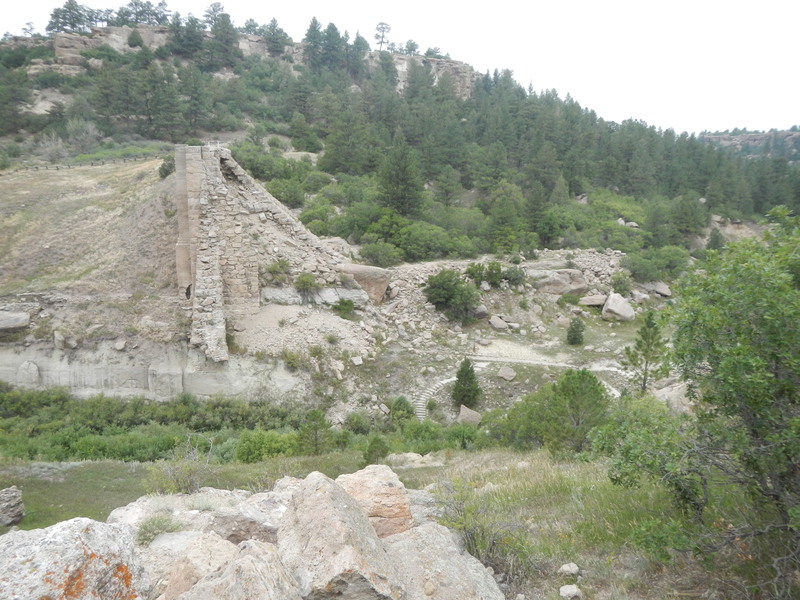 As luck would have it, we came upon the Dam Ruins Historic Site. I wanted to see these the last time I was in the park years ago, but missed them while hiking from the park’s main entrance on the east side. The old dam towered over us and the trail. It was seriously massive, and an impressive construction to behold. 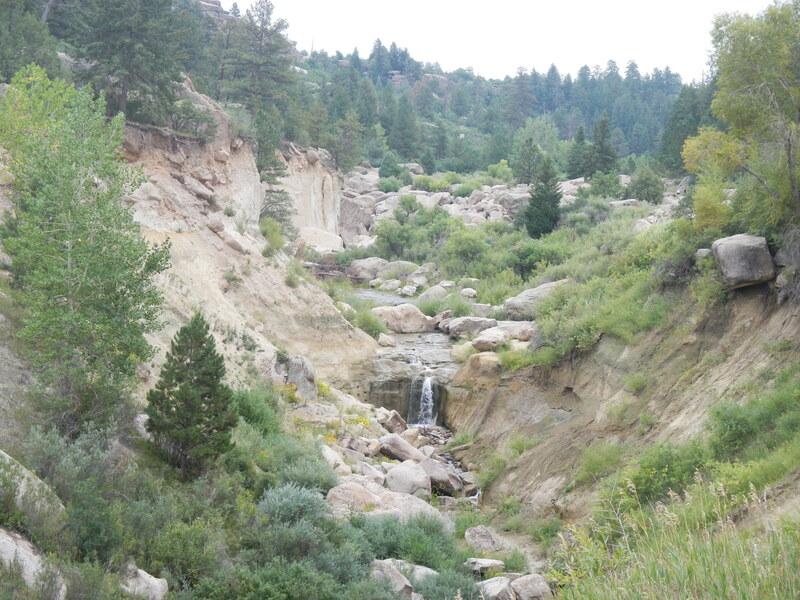 Built in 1889, the dam lasted several decades before it burst in 1933 after several days of heavy rain. The break in the dam allowed an estimated 1.7 billion gallons of water to spill forth in a massive wave that ran all the way into Denver. When it was all done, two people were dead and the damage extensive. A small wooden bridge crosses the Cherry Creek at the spot of the dam. 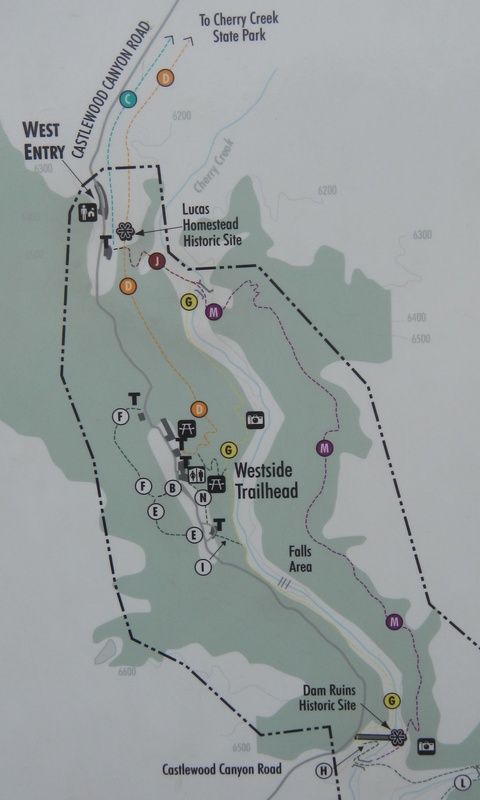 It leads to a trail just over two miles long that climbs the east side of the canyon and runs back to the trailheads by the west entrance. Other forks in the trails lead back toward the east side of the park. Anna and I continued back north, deciding to keep our hike to the west side of the park seeing as it was our first time out together and neither of us was sure how long the other could go. – Setting a pace and going slow is important so you don’t wear yourself out early on. – Taking poops early is better than late, so you can return to the trailhead to clean up your mess instead of carrying it around with you. – Drinking out of puddles will make you fart really badly. – Not everyone – people or other dogs – wants to play with you or be your friend. – Stepping on a cactus is no fun. – Bring plenty of bags to clean up after your pet, since you don’t know how many times she may go. – Carry not only enough water for yourself, but also more than enough for your pet; handy bottles with dishes on the end are great for dogs to drink from, but they’ll go through at least one of these while on a hike so be sure to carry refills in your backpack. – Your dog won’t know when to rest, instead forging on to the next great adventure, so be sure to call for frequent water breaks. – I can control my dog’s pace in the flat areas, but it’s my responsibility to keep up with her when she’s going up or down rocks or stairs since she has to leap from one to the other. – Picking cactus pricklies out of my dog’s feet is no fun. It took Anna quite some time to calm down while driving back home. She was obviously exhausted, but too hyped up from being out on such a great adventure. I had just as much fun as she did, and am now looking forward to taking her out on more hikes. 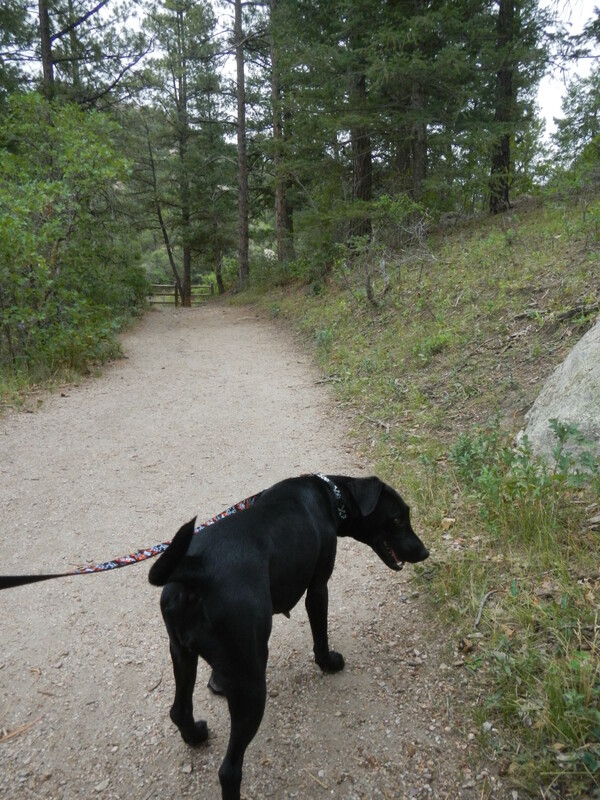 Do you know of any good puppy-friendly trails here in Colorado? What about anywhere else? If so, please share them. Thanks!